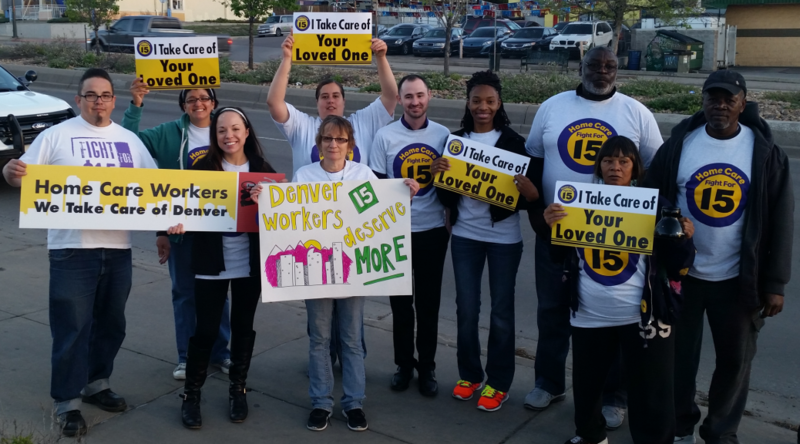 Home care workers from across the country joined together with fast-food, child care and airport workers, adjunct professors, and college students as part of the largest low-wage worker mobilization in history. Last year, when home care workers decided to stand up in the Fight for $15, we added hundreds of thousands of voices across the country to this movement. We are in it to win it. Together with fast-food and other workers, we will win $15/hr and a union for all of us. Home care workers are united in the Fight for $15 because despite doing the work that enables older Americans and people with disabilities to live with dignity and independence in their own homes, we can barely take care of our own families. Many of us are protested with our clients, who don’t think it’s fair that while we work so hard to care for them, we don’t make enough to care for our own families. We are among the lowest-paid workers in the country, getting paid just $13,000 per year, despite working in one of the country’s highest-demand, fastest-growing occupations. We provide daily support services like bathing, toileting, dressing, and preparing meals for older Americans and people with disabilities, allowing them to live with dignity and independence in their own homes. We can’t wait for higher wages. The landlord doesn’t wait and the electric company doesn’t wait, so neither can we. That’s why we are coming together and joining other workers across the country to fight for $15 and a union. When we get $15 in our paychecks, we’ll have more money to spend in our communities, lifting the entire economy.